Blogger doesn't have the feature of file sharing by directly uploading your documents, pdf files, presentations and other music files. So you need to know the way you can use other file sharing services with blogger. Following are described some ways you can use to upload and share your documents with your readers. The only alternative for file sharing is to upload your files to free workspace, a service provided by Google, Microsoft and other leading companies. A workspace is an online place where you can save, access, and share documents and files for online collaboration. After uploading your files to free web hosts, right click on the file and choose the option "Copy Link Location". Add this link to your post. Whenever a visitor clicks on the link, a popup window will open and ask the visitor to save the file to his computer. Its really very simple. Well, if you check your Post editor in blogger, you will find that you can only upload Pictures and Videos. The pictures that you upload in your blog posts are stored in Picasa Web album and it has limited web space. The space available in Picasa album is 1024MB. Similarly the same case is with your videos. Now that you have understood that you have a limited workspace in blogger, you should try to find a free hosting service for you right this moment so that you can keep yourself ready for the time when you run out of free blogger space. Where do I Find a Free Webhost? You don't need to worry because I am listing here some of the Best services. You must have been subscribed to blogger help group and might be posting your queries and answering other's queries. But do you know you can start your own group? Go to the resource section and add your own page. Click the + Upload file button. Search for the files on your computer. You are done!! If you want to share Photos with others then upload them to social networking sites like photobucket, flickr etc. and add the link to your blog post. Visitors will be taken to the page where you have stored your files. Skydrive offers you a whopping 25GB of workspace to upload your documents and files. The same procedure you have to follow here also. 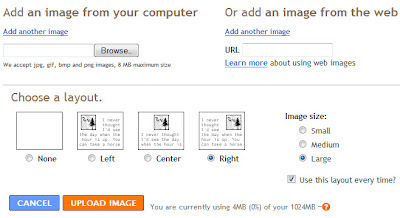 Upload files here and copy the link of a file and place it in your Blog Post. Microsoft Office Live Small Business is a service by Microsoft Corp. which offers you a professionally looking website for free. So you can create your website, store your documents there and share with others. The best thing is you can get a free domain name also if you don't want to take a custom domain or you can start with your existing domain also. With 5GB of free online storage and easy-to-create folders, you can organize all of your documents in one place and access them on the web.